To explore the UNIX file system, use basic UNIX commands and use a text editor. 2. 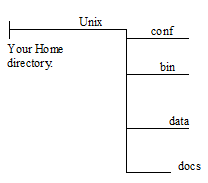 Create a directory "Unix" under your home directory. 4. Create the document called "sed-info" in your "Unix" directory using touch command. 5. Create the document called "join-info" in your "Unix" directory using touch command. 6. While in the Unix directory, move the files "sed-info" and "join-info" to directory "docs" using a single UNIX command. 7. Change to your home directory. 8. Use a single command to rename and move the "sed-info" from the "docs" directory to the "bin" directory. 9. Change to the data directory. 10. While in the data directory create a command that would copy the "sed-info" from the "bin" directory and "join-info" from the docs directory to the "conf" directory using a) absolute paths and b) relative paths. 11. Move to your home directory. Create a single command that would delete the Unix directory and all the files and subdirectories of the Unix directory.